with Guidewire Port for Central Venous Catheter Placement Kei Togashi1, MD; T Andrew Bowdle, MD, PhD1; Srdjan Jelacic, MD1 Justin Hulvershorn MD, PhD2 1Department of Anesthesiology and Pain Medicine, University of Washington Medical Center; 2Mirador Biomedical Introduction: Central venous catheter (CVC) placement is associated with significant morbidity and mortality, which can be reduced by the application of relatively simple safety precautions. Inadvertent placement of a large bore catheter into an artery may occur as often as 0.8% of attempted CVC placements1-3. The traditional method of avoiding arterial placement is to observe the color and pulsatility of blood in the needle hub prior to placement of a guidewire insertion. However, this approach has been shown to be unreliable1-3. Ultrasound may be helpful in avoiding arterial placement, however unless the tip of the needle is clearly visualized in the vein, the use of ultrasound may not assure venous placement.4 Measurement of pressure in the needle has been advocated as a highly reliable and convenient method for distinguishing artery from vein1-3. Traditional methods for pressure measurement include manometry (blood filled tubing attached to the needle) or the use of a pressure transducer, connected to the hub of the needle. Many operators find these methods to be cumbersome. Recently, a sterile disposable pressure transducer has become commercially available. This device received FDA 510k approval without testing in humans. The purpose of this study was to make an initial clinical evaluation. 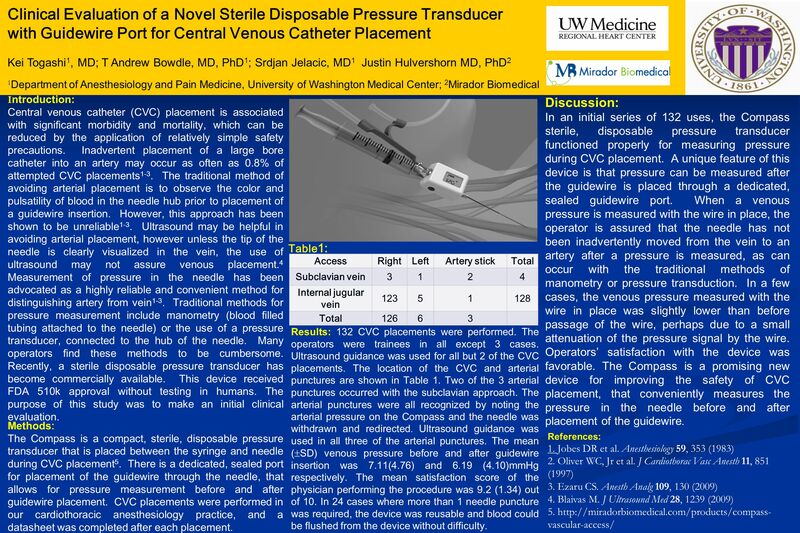 Discussion: In an initial series of 132 uses, the Compass sterile, disposable pressure transducer functioned properly for measuring pressure during CVC placement. A unique feature of this device is that pressure can be measured after the guidewire is placed through a dedicated, sealed guidewire port. When a venous pressure is measured with the wire in place, the operator is assured that the needle has not been inadvertently moved from the vein to an artery after a pressure is measured, as can occur with the traditional methods of manometry or pressure transduction. In a few cases, the venous pressure measured with the wire in place was slightly lower than before passage of the wire, perhaps due to a small attenuation of the pressure signal by the wire. Operators’ satisfaction with the device was favorable. The Compass is a promising new device for improving the safety of CVC placement, that conveniently measures the pressure in the needle before and after placement of the guidewire. Table1: Access Right Left Artery stick Total Subclavian vein 3 1 2 4 Internal jugular vein 123 5 128 126 6 Results: 132 CVC placements were performed. The operators were trainees in all except 3 cases. Ultrasound guidance was used for all but 2 of the CVC placements. The location of the CVC and arterial punctures are shown in Table 1. Two of the 3 arterial punctures occurred with the subclavian approach. The arterial punctures were all recognized by noting the arterial pressure on the Compass and the needle was withdrawn and redirected. Ultrasound guidance was used in all three of the arterial punctures. The mean (SD) venous pressure before and after guidewire insertion was 7.11(4.76) and 6.19 (4.10)mmHg respectively. The mean satisfaction score of the physician performing the procedure was 9.2 (1.34) out of 10. In 24 cases where more than 1 needle puncture was required, the device was reusable and blood could be flushed from the device without difficulty. Methods: The Compass is a compact, sterile, disposable pressure transducer that is placed between the syringe and needle during CVC placement5. There is a dedicated, sealed port for placement of the guidewire through the needle, that allows for pressure measurement before and after guidewire placement. CVC placements were performed in our cardiothoracic anesthesiology practice, and a datasheet was completed after each placement. References: 1. Jobes DR et al. Anesthesiology 59, 353 (1983) 2. Oliver WC, Jr et al. J Cardiothorac Vasc Anesth 11, 851 (1997) 3. Ezaru CS. Anesth Analg 109, 130 (2009) 4. Blaivas M. J Ultrasound Med 28, 1239 (2009) 5. Download ppt "Clinical Evaluation of a Novel Sterile Disposable Pressure Transducer"
Making Procedures Safe(r) Central Line Insertion Paul Currier, MD, MPH MGH Pulmonary & Critical Care Unit Associate Program Director for Procedures and. Bringing Solutions to Vascular Medicine ML2303 Rev A 10/10. What is it? Alarm Fatigue Alarm fatigue occurs when clinical personnel fail to respond appropriately to alarms due to excessive or inability to understand. Patient Chronicles Learning from the Journey. © 2013 Lifeline Vascular Access. All rights reserved. Proprietary and confidential. Do not copy; do not. Emergency Airway Modification Combination Catheter for Transtracheal Jet Ventilation and Retrograde Intubation Friedrich W. Haimberger 1 Advisor: Steven. The Central Line Bundle and YOU! 1 Arterial Lines Set Up & Monitoring Union Hospital Emergency Department.